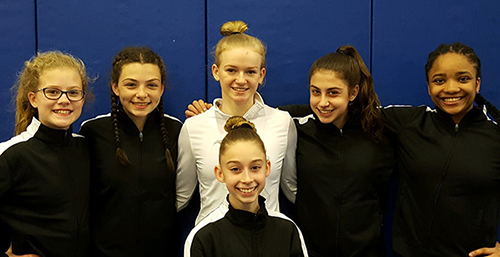 Several Bright Raven Gymnasts qualified to advance in USA Gymnastics competition this season by earning high all around scores at Championship meets. Emily Field of Greece and Sydney Sack of Spencerport both qualified to compete in the Level 9 Regional Championship held in Springfield Massachusetts May 13-15 by earning high all around scores at the New York State Championships. At Regionals, Field earned a bronze medal on the uneven parallel bars and finished sixth on both balance beam and all around totaling 34.375 which qualified her to advance to the Eastern Championships held in Rochester May 6. At Easterns, Emily Field placed seventh on the uneven bars. 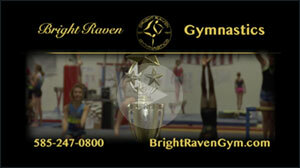 Bright Raven had 5 gymnasts qualify to compete in the Level 7/8 Regional Championships held in Springfield, Massachusetts April 28-29. In the Level 8 Senior C competition, Naimah Muhammad of Rochester captured first place all around and first in floor exercise. Muhammad also placed third on vault and fifth on bars. In the Level 8 Senior B division, Kylie Rozzi of Spencerport earned first place in floor exercise, fourth place on balance beam and fifth all around. Liliana Sack of Spencerport placed fourth on bars, fifth on balance beam and fifth all around. In the Level 8 Senior A division, Jillian Ambler of Fairport finished fourth on vault, sixth on floor and seventh all around. Madison Isenberg of Brockport qualified to compete as a Level 7 gymnast and finished eighth on the uneven parallel bars. The USAG Region 6 Championships include gymnasts from all of the New England States in addition to New York. Gymnasts qualified to compete in the Regional Championship by earning high all around scores at their individual State Meets. Level 9 gymnasts qualify for the Eastern Championships by earning a high all around score at Regionals. The Eastern Championships include gymnasts from 26 states.